Any attempt at building a solid service management strategy must include management consolidation. Unless you are a very small IT shop with only two or three products or applications to manage, you are most likely spending unnecessary resources on managing not only your IT infrastructure and applications but other parts of your enterprise as well. In this chapter, we'll examine the need for management consolidation—the benefits and what you can do to achieve effective management consolidation. This is merely a short list. I'm sure you have your own infrastructure management requirements. Figure 3.1 illustrates the complexity facing many organizations today. This is not a literal representation or a flow chart; think of it more as a conceptual illustration. Figure 3.1: Complexities of service management. The connecting lines indicate a relationship of some sort, often something that also must be monitored or managed. Very often, all of these tasks must tie into an overall business service management strategy using a variety of management tools or homegrown integrations solutions, resulting in a very complex integration. It's been my experience that complexity usually implies "more expensive" and "less efficient." Typically, this tangled web of point products can't present a consolidated view of IT and business operations. Without that visibility, the transition to a dynamic infrastructure becomes that much more difficult. Without that visibility, you can't move from an IT‐based management philosophy to a business‐centric philosophy. There are other challenges as well, which I'll get into later in the chapter. Many organizations picked up management tools in an ad hoc and completely unorganized fashion, at least as far as the enterprise is concerned. Very often, tool sets were brought in to support silo‐specific needs. How many management tools are deployed in your enterprise? How many are actually being used? How many are still sitting on the shelf? Consolidating your management toolsets for infrastructure, applications, and non‐IT areas such as HVAC can go a long way towards meeting these objectives—as we'll explore in this chapter. Maintain the Status Quo or Not? Many organizations are content to stay with the status quo. After all, change is never easy. However, most midsize companies are probably supporting 10, 20, or more applications across the enterprise. This number has likely grown over the past 10 years. Finding an adequate toolset for all these applications is challenging, if it exists at all. Many companies simply opt to maintain their current situation, despite the risks. Without adequate consolidated management tools, mean time to repair continues to rise as support staff lack the visibility into IT operations to properly identify and rectify problems. IT professionals are forced to rely on in‐house knowledge and occasionally homegrown solutions to provide the necessary visibility into the business service. That's actually part of the problem with the status quo: IT professionals are often stuck in silos and can't address problems from a business or enterprise perspective. For business‐critical and revenuegenerating applications, this reality equates to a loss of hard dollars, not to mention customer goodwill. I don't see how anyone could find this acceptable. This tool sprawl also leads to higher costs for licensing, infrastructure resources (which adds energy as an indirect cost) and training expenses. I expect you'll also see a lack of coordination and planning. In addition, there's no guarantee there are no overlaps, or even worse, gaps in application management toolsets. The status quo alternatives come down to "Best of Breed" vs. "Management Consolidation." In the former approach, you select the best solution for a given product class. The theory is that you gain synergy from a collection of "bests." For many companies, this approach is business as usual. It is comfortable and offers a sense of security. If you are still a silodriven company, this approach should be satisfactory and the people running your silos will be very happy. However, this method retains the focus on the silo as opposed to business services that span the enterprise. A best of breed approach is more expensive overall because each silo has its own acquisition and product life cycle. More than likely, this also means multiple vendors, which can lead to increased licensing costs, more time spent on contract negotiations, and increased training and support costs. This approach does nothing to create the magical "single pane of glass," providing insight into the entire business process. Finally, even after all of this work, is there any guarantee that you've changed the status quo? There's no doubt that best of breed solutions offer value, otherwise they wouldn't be considered best of breed. But if your organization is looking to move to a service management strategy, the aggregate of best of breed solutions fails to meet your objective. Let's contrast this with an alternative—management consolidation. The goal of consolidation is to find a single vendor solution that meets all your management requirements, or at least as many of your requirements that you identify as business critical. Bear in mind, the solution is probably not a single product but more likely an integrated suite with a single management interface. The only real downside, if you could call it that, is that silos lose out on control. Let's revisit the illustration I provided earlier with a consolidated management solution. I no longer have a multitude of management products from a variety of vendors, nor do I need any homegrown integration solutions to fill in any gaps. Instead, I can centrally manage my entire operation from a single point, which makes it much easier to connect to my overall service management strategy. Let's explore the benefits in a little more detail. One tremendous benefit, and one of the first you should look at, is the effect consolidation will have on IT operational cash flow. With the proper solution, you can realize very serious savings. Let's assume you've consolidated. What does that mean to you and your organization? First, you've eliminated a number of management tools, probably from a variety of vendors. This means few vendors to manage, simpler contract negotiations, and reduced licensing or support costs. You've also most likely removed redundant or obsolete tools and processes that may have been more of an obstacle than a benefit to efficient IT operations. More than likely, your new consolidated solution includes automation features that automatically translate into more efficient and cost‐effective processes. The "single pane of glass" that you now have offers you deep insight into business and application processes that span the enterprise. Because you can better identify problems, perhaps even before they become serious, you can better manage revenue‐critical applications. For example, suppose you have a complex Web service involving a number of back‐end database systems running on clustered servers and requiring extensive transaction brokering. Service loss or interruption would have serious financial implications. In a siloed environment, tracing a problem through this maze would be time consuming and expensive, and likely wouldn't offer the option to identify a potential problem before it becomes more serious. Yet with the consolidate solution, you can easily trace problems across the disparate elements, reducing your mean time to repair (MTTR). It may even be possible to identify future problems before they manifest themselves. By reducing the MTTR, you reduce potential revenue loss. If you can predict where a problem might arise, you've saved even more. Related to improved cash flow is a reduction in operating expenses. You should be able to achieve both direct and indirect savings. Because you've eliminated a number management tools, you have most likely also eliminated corresponding licenses and support costs. Certainly some of the immediate savings may be offset by the consolidated solution, but that merely has to factor into your return on investment (ROI). Still, let's say that conservatively you eliminate six management tools distributed to handle 10 servers, where each tool includes a per‐server license in addition to a license for the management software. By eliminating these licenses, you have realized a savings of $30,000 (see Table 3.1). Table 3.1: Consolidation license savings. If some of these management tools required dedicated server resources, which isn't uncommon, that you no longer need, you've realized even more savings. Remember, these are very conservative numbers. A reduction in toolsets generally means a reduction in training costs as well for your IT professionals who must use those tools. Let's look at the savings using the same number of eliminated tools as earlier. Conservatively, not every IT professional requires training on every tool, so let's say overall you average five IT professionals that on average need 4 days of training. $600 a day for professional IT training is a very realistic figure, and if anything, is probably on the low side. This means it costs $12,000 in training costs per tool. Multiply that by the number of tools, and you are saving over $70,000. You can see the results in Table 3.2. Table 3.2: Consolidation training savings. The other savings we should calculate is that instead of spending 120 man‐days in training (five IT pros × average 4 days per tool × 6 tools) overall this will most likely be trimmed down to no more than 25. Think of how much you could accomplish with almost 100 extra man‐days. Consolidating your management toolset for both infrastructure and application implies centralized IT management. Instead of professionals in different silos managing different operational aspects, you now have the ability to get the "big picture." This approach makes it much easier to move to a dynamic infrastructure. As your environment grows and changes, new deployment costs should be lower and the whole process simplified. Before, you might have had to deploy or configure several management tools for new or modified elements, such as a new server or application. With a consolidated approach, you only have a single deployment or configuration task. Even then, a top‐notch management tool should make this even easier through automation. Centralized management also means a single reporting source that can span the enterprise. I hope you realize how significant this is when it comes time to meet governmental or regulatory compliance requirements. Suppose you have to report on who accessed sensitive or protected data, from where, and for how long across a complex system or application. In the past, you may have had to cobble together a report from a variety of sources and tools. With centralized and consolidated management, you should only have to go to one source for all the necessary information. Finally, if your organization is striving to meet IT Service Management (ITSM) goals, your centralized and consolidated solution most likely includes a CMS, previously referred to as the Configuration Management Database. The CMS plays a key role in providing deep insight into IT operations, which should drive down your support costs. Don't let the nomenclature fool you; this may not necessarily be a single database. In fact, it probably won't. Instead, the CMS may be distributed among a suite of integrated products that provides the consolidated management toolset you seek. With a single management interface, it should be easier to trace application workflow across the enterprise. This also means if there is a problem, it will be that much easier to track down. Your new management tool should provide deep insight into your operations. Such insight should make it easier for you to anticipate or predict problems before they get out of hand. Wouldn't you rather detect a memory leak on a critical database server that is part of an e‐commerce site before it has a negative impact on your customers? An effective management tool should let your IT pros identify a problem, track down the root cause, and apply corrective measures. Ideally, your new management tool will include automation features that let it respond to events without human intervention. For example, if a hung process is hindering application availability, the immediate solution may be to terminate the process. Instead of a management tool that requires an IT professional's interaction to become aware of the problem and take the necessary steps to terminate the offending process, our consolidated solution detects the problem automatically as soon as it arises and immediately corrects the situation. That's definitely an improvement in operational monitoring. I would expect that my consolidated toolset includes features to dynamically adjust my infrastructure to best utilize all my resources without requiring much human intervention. The flip side is equally important. Now it should be easier to identify constrained hardware that may be adversely affecting your infrastructure or application performance. Perhaps you aren't technically experiencing a problem because nothing is really "broken," but identifying bottlenecks as a result of high resource utilization will help you address the situation before it becomes serious. In addition to hardware utilization, your new toolset should help you identify lowutilization applications and software. Because we've broken out of the silo, it should be easier to see which applications are sitting idle or getting little use. If these applications are costing you money in terms of licensing, maintenance fees, or dedicated IT resources, they may be good candidates for elimination or maybe even virtualization. To eliminate redundant and down‐level vendor tools is the whole point of consolidation and is so central to implementing a successful service management strategy that it bears repeating. I'm talking about IT infrastructure, business applications, and ideally non‐IT infrastructure tools that you hope to bring in to the management fold. It is not unexpected that a company might support up to 50 business applications across the enterprise. Add in your tools for monitoring servers, networks, and the like, and you have a hefty management challenge. I'm betting that many management tools you are currently using were introduced in an ad hoc fashion. You had a problem with database performance, so you acquired a database monitoring and performance tool. Although this may have solved the problem, the tool's feature sets overlap with another server monitoring tool you are already using and paying significant licensing fees for. You see this type of behavior in a silo‐driven organization, which in simpler times was acceptable. However, business applications and IT services are significantly more complicated than they were even 5 years ago. Now we have Service Oriented Architecture (SOA), Web services, Software as a Service (SaaS), grid computing, and cloud computing. Instead of addressing servers and services from a bottom‐up approach, which I think of as legacy management, we need to address this from the top down. We have to look at IT operations across all functional areas to better understand the intricacies of integrations. To achieve this, we need to move away from these sorts of down‐level tools and move up the management space. With a high‐level, integrated and consolidated approach, we can eliminate older tools, tools that overlap, tools that aren't really being utilized and tools that are just frankly hard to work with. I'm sure you have at least a couple. We've already seen the additional benefits you realize by eliminating out‐dated or unnecessary tools. In addition to eliminating downlevel vendor tools, you can eliminate the home grown or ad‐hoc solutions that you have had to come up with to fill a gap or provide the missing integration. I've been discussing the benefits consolidation brings to the table in relationship to things you've done in the past. But what about tomorrow? How does management consolidation affect your future projects? I'm assuming you've consolidated to a solution that spans the enterprise, breaks down silos, offers some degree of automation, and provides the requisite CMS. What does this mean to you? As you roll out any new IT project, there are associated labor costs. Servers have to deployed and/or configured. Applications need to be installed. Don't forget the need to secure everything. On top of this, you need to be able to monitor performance, detect problems, and resolve them in a timely manner. All of these things historically would have been done manually or at least initiated by IT professionals. Once deployed, you have ongoing management and support. However, now we have a single "all‐knowing" management tool. IT professionals don't need training on half a dozen different tools to handle the variety of tasks. They go to a single source to manage everything, hopefully with some automation thrown in for good measure. Should things go wrong anywhere in the deployment or configuration process, or problems crop up in production, you have a single window making it that much easier to identify and resolve the problem. All of this should drive down associated labor costs. A corollary benefit is that you can and should be able to better manage licensing. The right consolidated management solution will offer flexible licensing. In the past, when you had a variety of tools from a variety of vendors, they likely each had their own licensing scheme. Unfortunately, this setup has the negative effect of locking down your infrastructure unless you purchased additional licenses—hardly something that leads towards a dynamic infrastructure. For example, suppose you are going to roll out a new project that includes an Oracle database, a new server running Solaris, and a few load‐balancing Windows servers on the front end (see Figure 3.3). You need the ability to manage all the servers, now a mix of Windows and Solaris. You need database management and monitoring. You need transactional analysis. Oh, and the new database is getting its data from a Microsoft SQL Server that is to be decommissioned. 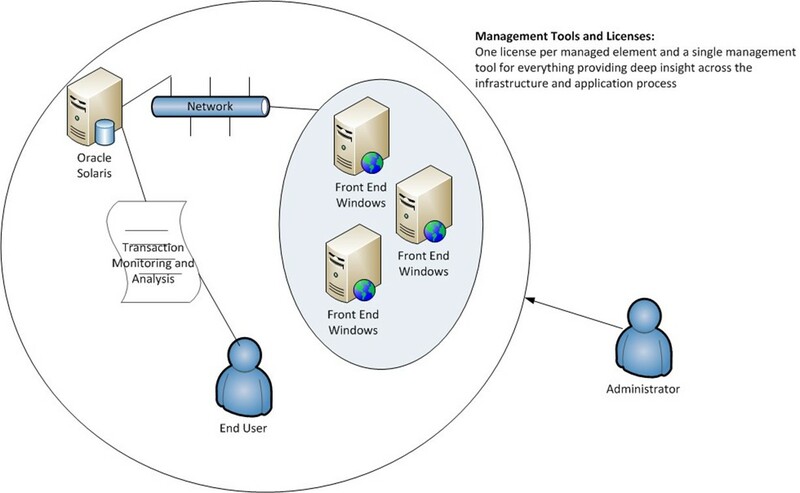 Figure 3.3: Licensing and management "before." In the silo‐based world, you would most likely need to acquire new licenses and management tools for the additions, yet you are likely still "stuck" with a license structure and toolset for Microsoft SQL that you no longer need. Clearly, a better approach is a solution that allows you to dynamically re‐allocate licenses as needed and is essentially agnostic (see Figure 3.4). Figure 3.4: Licensing and management "after." Granted, this scenario is more technically complex, but that's specifically the point. It's not unreasonable to assume that a more mature application will grow in complexity. The question you must ask yourself is, given a comparable scenario, how difficult or expensive would it be from a licensing (and management toolset) perspective given your current infrastructure? Moving to a consolidated approach with flexible licensing stretches your licensing dollars further and simplifies your overall management. Management consolidation is a critical component of an effective service management strategy. In fact, I would venture to stay there is no other single step you could take that would have such far‐reaching impact into your organization and IT operations. I'm not implying by any stretch of the imagination that it is an easy process. But once the consolidation process is complete, the way you do business will fundamentally shift and you will be well on your way to a solid service management strategy that will be costeffective, efficient, pro‐active, and far‐reaching. I'll give you some shopping tips in a moment, but let me offer suggestions for what you should be looking for as you consider a vendor or toolset that will become the foundation of your management consolidation efforts. Consider the management capabilities in your current toolset. Are you still stuck in the silo mentality or can you view your operations across the enterprise? Do you have ad hoc or homegrown integration solutions to provide management capabilities missing from your existing tools? First and foremost, management consolidation should focus on improved management. You don't want IT professionals to have to learn half a dozen different tools, especially when they don't give you the "big picture." You should seek out a consolidated solution that offers the "single pane of glass" across everything. You should be seeking a solution that breaks out of the silo and offers deep and integrated insight into your infrastructure and applications. Certainly, you should have a list of what management tasks you need to continue. But you should also create a list of the management gaps. Any need that is currently being met with a homegrown solution should go on this list. What can't you do now that you wish you could? Is there anything you should be doing? Don't forget to look at any governmental or regulatory compliance requirements. In order to achieve a dynamic infrastructure, monitoring and analysis are critical. The adage, "You can't manage what you don't measure" definitely applies here. You need to be able to monitor every aspect of your infrastructure and applications. Can you trace, record, and analyze data flows across your environment? Or is information lost crossing silo boundaries? What types of information would you like to monitor that you can't now? Again, anything being handled with an ad hoc solution should go on your list. I'm a firm proponent of keeping monitoring history and baselines. Without history, you can't easily or quickly identify a potential problem. You also can't conduct forecasting or trend analysis, which is required if you want to be proactive. On equal footing with monitoring is response. Sure, you can monitor and see that memory utilization on an application server is now running at 88% utilization, or that 10 attempts have been made in the last minute to authenticate with an administrator account. But what can you do about it? How much human interaction is required? You want a consolidated management tool that touches everything you do and lets you monitor down to the most granular element as well as step back and assess the "big picture." Related to the previous feature requirement is improved reporting. To this, I also include improved alerting or communication. All the monitoring in the world doesn't do you any good if it isn't passed to the necessary IT professional in a timely manner. Again, look at your current situation. What management reports can you produce? What management information are people asking for that you haven't been able to provide? Ad hoc solutions to pull out reporting information should be targets for replacement. I'm sure some reporting from your silo‐based tools is just fine. But do they tell the whole story? The point of reporting is to provide information that will support management decisions. If you can't get the utilization information you need, how will you know where to spend your limited budget? How will you be able to identify candidates for virtualization? Finally, let's not forget reporting needs to meet regulatory and compliance requirements. Obviously, you need to provide the necessary information, but how flexible is it? Let's turn back to one of my earlier scenarios: migrating from a Microsoft SQL server to Oracle. We'll extend this scenario to include compliance reporting for database security, access, and integrity. You had a SQL tool to help with the reporting. Now you need an Oracle tool. Wouldn't you rather have a consolidated management tool that could handle both? Think about tomorrow. What if you need to deploy an Informix‐based application with similar reporting requirements? You don't want to keep deploying new management tools. The whole point of management consolidation is to reduce the number of existing tools. Why pay for 10 management tools and related licensing costs when you can accomplish everything with one license? You need to know exactly your current management costs. What are you paying for? How much of what you're paying for are you actually using? How flexible is your current licensing arrangement? Only when you have this information will you be able to properly assess potential consolidation solutions and calculate an acceptable ROI. You might even be able to find a vendor that offers completive upgrades or "trade‐ins." A major goal and benefit of management consolidation is a reduction in labor costs. A consolidated solution must allow you to accomplish "more with less." Instead of an administrator needing to interact with half dozen or more tools to get her job done, she can use a single tool and accomplish her work in a fraction of the time. You should also realize a gain without the need for multiple product training for multiple IT professionals. I'm not suggesting management consolidation as a means to reduce head count. Rather, some of your labor costs can be shifted from routine management tasks to more value‐added work. I'm assuming you hired these professionals in the first place because of their creativity, imagination, and experience. You need to take advantage of those qualities by giving them opportunities to contribute to your organization. Management consolidation should give them more information to get the required work accomplished, and then, because consolidation introduces scales of efficiency, there should be time available now for highvalue work. Finally, your management consolidation goal must be to reduce your overall infrastructure costs. What is the cost of managing not only your IT infrastructure but other aspects of your company as well? If you can consolidate management of non‐IT items such as HVAC, utilities, security, and access control, so much the better. Why have a collection of assorted management tools that are consuming valuable resources when there may be a solution that supports consolidation. You need to know your current costs so that you can accurately determine ROIs when comparing potential solutions. Now that I've laid out what I think your goals should be, how do you get there? The following sections provide a short list of tasks I think you should undertake as you seek out a management consolidation solution. The first step must be an inventory and assessment of all management tools in your enterprise. Start with IT, but I encourage you to look at traditionally non‐IT areas, like the ones I've mentioned earlier. Your inventory should include all tools whether they are actively being used or not. What features do they provide and at what cost? I would also assess each tool's strengths and weaknesses. When considering a new solution, you don't want to give up too much strength and hopefully can find a solution that addresses the weaknesses. If you aren't using automation much now, you should be. As part of your management inventory, include what automation options your current toolsets offer. You'll also want to be able to identify areas where you think automation would benefit your company. Part of this analysis falls under Gap Analysis, which I cover in a moment. Because all your efforts are aimed at implementing an effective service management strategy, if you haven't done so by now, you need an inventory and assessment of all ITrelated services or applications. As with the management tool inventory, I encourage you to also look at non‐IT services. What is offered, how is it offered, and who is the consumer? I'm speaking about internal and external consumers of IT services. Do you have service level agreements (SLAs) that must be met? What is the service's relative value? Or to look at it another way, what would be the effect on the company if the service was not offered. You need to prioritize. High‐value services need effective management tools to ensure availability and solid performance. When considering a consolidation replacement, you must ensure it can meet these requirements. Now that you know you have to manage what you offer, you need to determine where you have gaps. What can't you do now that you wish you could? What requirements do you have where you currently have no management solution? What gaps are you plugging now with homegrown or ad‐hoc solutions? Those are great candidates for replacement. I would also prioritize these gaps, or your need to fill them. One way to perform this assessment is to ask the question, "If I could do X, what would it mean to the company's bottom line?" By this point, you should have a solid set of requirements for any consolidation solution. As you deal with vendors or begin an RFP process, these requirements, including those that fill the gaps, are the foundation. In addition, I would search for platform‐agnostic solutions or at least those that promise the greatest amount of interoperability. Just because your Web servers are running Windows today doesn't mean they might not be running Open SUSE in a few years. You need a management solution that is flexible enough to meet the dynamic infrastructure you are attempting to build. When researching potential vendors and their solutions, you need to consider who offers the best chance to achieve the "single pane of glass." Does the product break down silos and make it easier to trace IT operations and applications across the organization? I would also examine the work effort required to deploy the new solution and decommission existing management tools. How long will it take? What other resources might be required? You've assembled the necessary financial data related to your current operational costs, so you should be able to develop a realistic ROI. In this chapter, I've talked about items such as licensing, training costs, labor costs, reduced MTTR, and more. All of these should factor into your calculations. Finally, since we've been talking about service management, I personally wouldn't consider any solution that didn't feature a CMS. To be truly effective, you will need, if you aren't already, to follow ITIL principles. A CMS is a key component that I would label a requirement. When you've narrowed your short list to two or three vendors, I believe it is critical that you get as much real‐world testing and assessment of their solutions in your environment that you possibly can. You and your IT professionals need to assess for yourselves the management tools' effectiveness. Go through your priority list. Can you properly manage what you need to manage? How easy or difficult is it for your staff to use the management tools to get their daily tasks accomplished? In a test setting, introduce a problem and document how well the management tools handled it. I would introduce a series of problems ranging in severity, individually of course, from say an unplugged network cable or failed disk to a hung process or memory leak. If you have an application that has a potential vulnerability, I would definitely test the potential solution against that situation. Because you might be consolidating non‐IT tools as well, be sure to include at least a representative of anyone who might need to interact with the replacement. How easy is it for them to use? Does it meet their requirements? Your pilot should also include a full range of reporting. More than likely, you will have identified some reporting requirements. Are they met? Are there other reporting features that add unexpected value? "Value" is the critical principle in all of this. Better management of IT operations and services should add value to the company. If the management tools themselves don't contribute to this value proposition, they are probably not a good match for you. There it is. You did it. After all that work, you have consolidated management to a single vendor solution. However, you can't rest now. I can't think of a single IT shop I've been in that wasn't constantly changing, evolving, or growing. Your needs probably change at least annually. Customers of IT services have needs that might change even more often. The acquisition process I outlined is really an iterative process with no end. You are likely to identify new requirements at some point that will need to be addressed. You should also keep up with your vendor because more than likely their product isn't remaining stagnant either. Ideally, their product continues to evolve and mature. That would certainly be something I would take into account when comparing products. In a perfect IT world, their new features will dovetail nicely with your new requirements. Perhaps that is naïve, but aligning product features with your requirements is considerably easier when you don't have to juggle a multitude of management products. Management consolidation makes many things possible.